If you're new to hosting golf tournaments, you might be wondering how many people it's appropriate to allow! These figures assume a shotgun start with two teams beginning at each hole. Of course, you should want to have the maximum number of people so that you can fundraise the maximum amount and have a full showing. However, if you invite too many people, your pace of play will be slow and the golfers will be frustrated. The math is simple - multiply the number of people on a team by the number of holes. Then, multiply that by the number of rounds you'd like to host. But don't look at that number as your final answer. If you're maxing out your players, you're sure to have frustrating wait times on the course. If your golf tournament includes players will varying skill levels, give yourself some extra wiggle room in order to make up for the combination of fast and slow players. If you're hosting an all-professional or entirely recreational tournament, this tactic will still help ensure the game is enjoyable. To calculate a good amount of wiggle room, simply remove one or two teams from the equation. 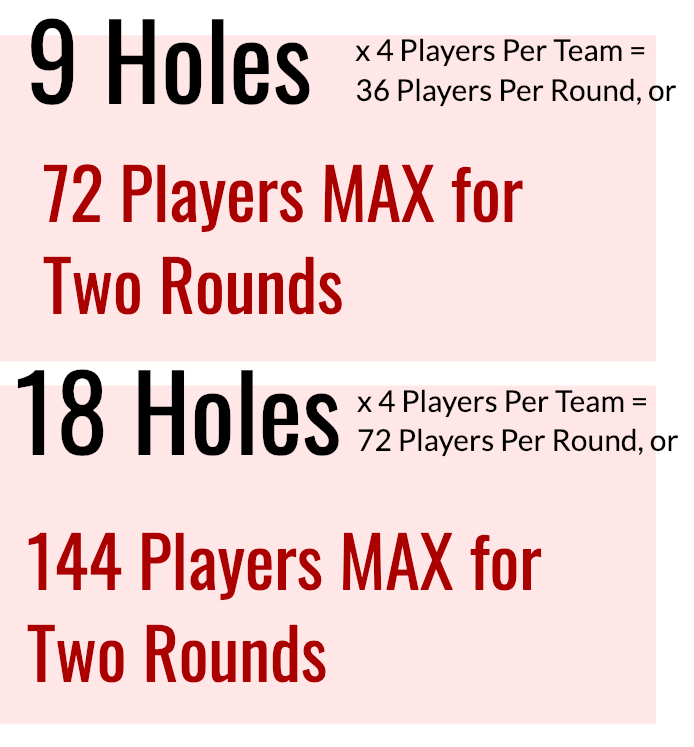 If you are hosting an 18-hole tournament, you have a maximum of 144 players. By reducing this by three teams, you'll lose 12 players. However, that 3-hole wiggle room can help ensure that the golf course doesn't get backed up. Cap the tournament at 132. If you're trying to absolutely ensure a comfortable pace of play, reduce the number further. Take it down to 30 teams, amounting to 120 people. It's a balance. Less golfers means a less hectic (and more fun) round of golf, but it also means less $$$. You have to decide what the middle ground is for your tournament.